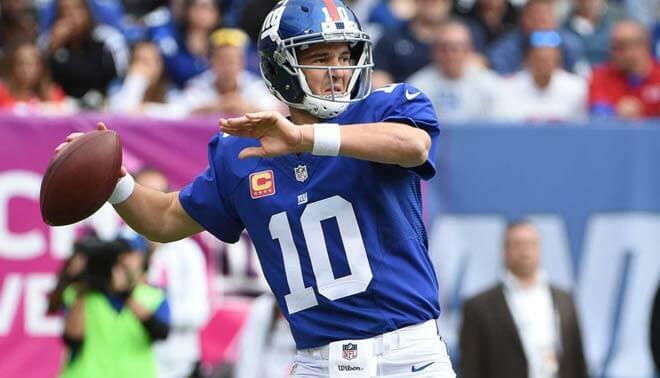 According to sports betting sites Eli Manning could lead the 2017 NFL season in passing interceptions, though he will have stiff competition from Phillip Rivers, Blake Bortles, and Jameis Winston. Eli tied for 4th place with Bortles and Brock Osweiler in that category in 2016 with 16 picks, but perhaps one thing he has going for him – or against him, as the case may be – is that throwing interceptions seems run in the family. Older brother Peyton finished second in 2015 – his last professional season – behind Bortles with 17 intercepted passes. He had 15 the previous year and 10 the year after that. As a matter of fact, the elder Manning only threw single-digit picks once in his storied career; that being the 2006 season (9). As for Eli, he threw a combined 44 interceptions in the past three seasons, and has thrown 20 or more picks three times in his career – 20 in 2007, 25 in 2010, and 27 in 2013. Speaking of which, San Diego Los Angeles Chargers QB Phillip Rivers led the NFL last season with 21 interceptions; the most picks in a single season since 2013. Rivers had previously thrown 20 in 2011, and 18 2014. The Chargers’ offensive line is nominal at best, which allows other teams to exert undue pressure in the pocket, which in turns leads to Rivers having to get rid of the ball without a clear target. Having said that, the last of only four times that a quarterback has paced the league in interceptions was 1988-89 when Vinny ‘Greenhead’ Testaverde topped the category back-to-back. So while sports betting sites give Rivers the same odds as Manning, Bortles, and Winston he is at the same time the least likely to do it. For instance, the King of Garbage Time Blake Bortles led the league in 2015 with 18 passing interceptions but actually threw fewer last season – in fact, had a career-low 16. Still, 51 picks in three years in the NFL makes it seem as if this is not something he will be able to outgrow. Even the greatest don’t have steady hands from the get-go. Peyton Manning tossed 28 interceptions in his rookie year. But Bortles seemed to have settled into distinct pattern of finishing no worse than fourth in passes intercepted in any season of his career. And if last season is any indications, things might get worse before they get better. On the other hand, Bortles arguably has nowhere to go but up. Finally, we have Winston who finished second in this category last year with 18 picks – three more than his rookie 2015 season. There is reason to hope, however, that the Tampa Bay signal-caller can avoid becoming another Blake Bortles. And just in case you’re wondering why Ryan Fitzpatrick is not on this list, that’s because the erstwhile New York Jets QB – who threw 17 interceptions last season – signed with the Bucs on May 19th (shout out to Kane) which for all intents and purposes makes him Winston’s backup.